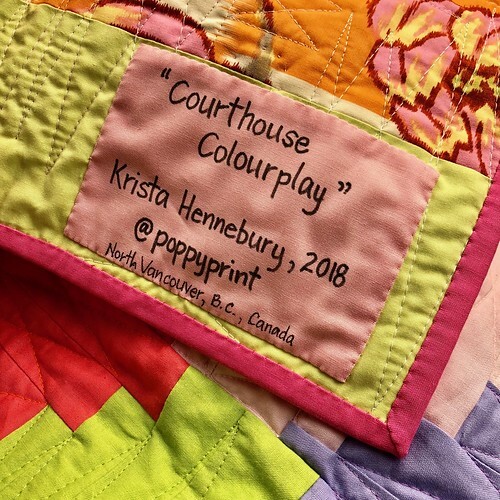 I'm so pleased to introduce my latest workshop sample, Courthouse Colourplay. Creating this quilt in a completely (somewhat planned) improvisational style was so much fun for me and I hope that my future workshops will have the same effect for students. I love log cabin variations and it is no secret that the Courthouse Step block is one of my favourites. This quilt is actually deceptively small at just over 40" square. When I showed it at the last Vancouver Modern Quilt Guild meeting, that was the first thing most people said, "It's way smaller than I expected!". Ah, the beauty of social media photography. Wouldn't it be a fun playmat for a baby/toddler? Or a cheerful wallhanging outside your bedroom door to wake you up in the morning? 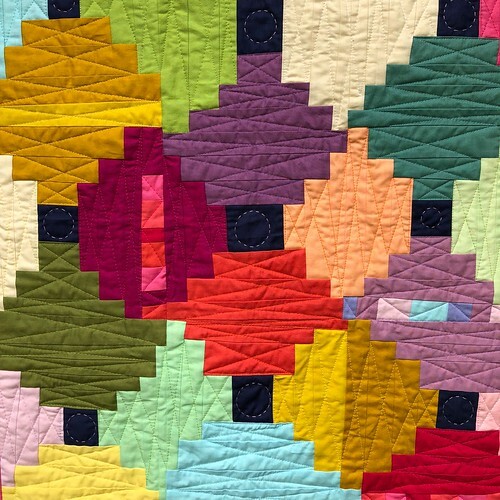 It is made almost entirely of Free Spirit solids, giving the quilt a fun paper lantern look. This is my first attempt at free-motion ruler work. I still need lots of practice, but I enjoyed it! Lots of colour changes, making my way through my Aurifil 40 wt collection. I decided to make this second version after creating a mini for my MQG swap partner at QuiltCon last February. 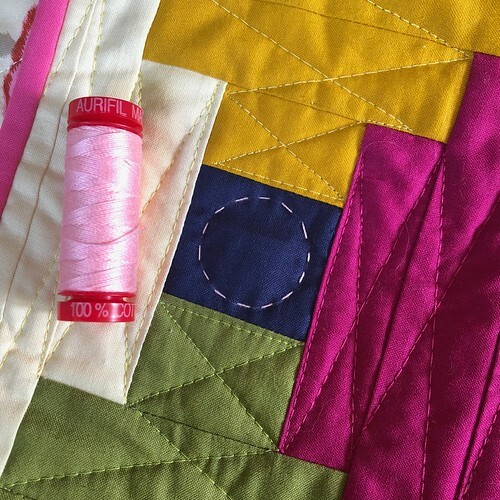 I pieced the blocks at a retreat last spring in the company of mostly traditional quilters. They watched with wide eyes as I free cut (rotary cutter, no ruler) all of the strips from fat quarters and started piecing blocks from the middle of the quilt out. Nothing is squared up....rather the blocks are "built out" with filler strips (pictured below) made from trimmings. This is the fun part for me! Bonus: there is very little waste in creating this design. A little bit of handquilting using Aurifil 12 wt thread in the softest pink. Based on the comments of my fellow retreaters (how are you going to put this together?? You haven't drawn it out first?? How do you know what colour to use next?? Will it end up square??) I realized that this could be a wonderful addition to my workshop roster. Yet another class for the Improv Curious quilter. This is rapidly becoming my specialty and I LOVE THAT. Sharing the freedom of improv quilting with folks ready to move on from the constraints of making other people's patterns is incredibly exciting for me. The workshop debut takes place Saturday, February 23, 2019 at a modern "staycation" retreat put on by the super fun team at Dinkydoo . We'll be sewing at their fancy new warehouse location about an hour outside of Vancouver and local accommodation is available about 5 minutes from the venue. 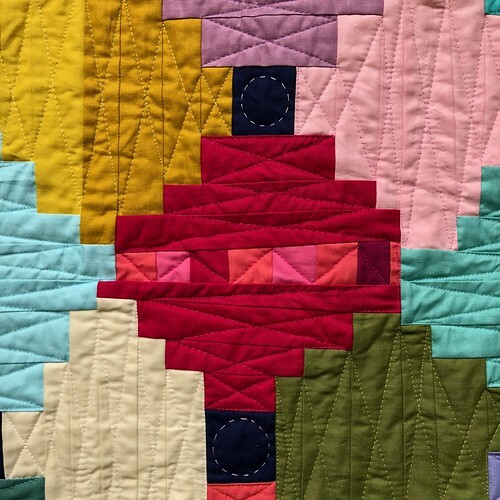 For those of us who can't make it to QuiltCon2019, this is a great alternative! I can hardly wait. I know it's going to be a weekend full of laughs and creativity. I'm also booked to teach this (and 3 other workshops) at QuiltCanada 2019 in Ottawa from June 12-15. That will be a super exciting weekend with a killer workshop line-up. The classes haven't been announced yet, but the faculty is introduced here. I'm so happy to have this opportunity and look forward to seeing many friends in Ottawa next spring! If your guild might be interested in trying this class, feel free to email me for availability - I'm booking into fall of 2019 now, but I still have some spring dates available, too. 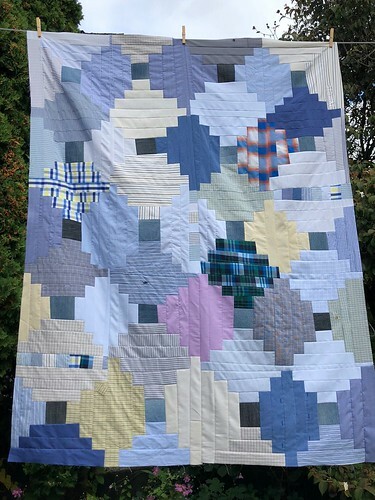 To further explore the construction techniques I used for Courthouse Colourplay, I'm recreating the quilt in a queen-sized version using upcycled men's shirts and jeans. I'm going to call this one Casual Fridays. The swishiness (highly technical term) of woven shirts is proving a bit challenging, but I am taking a very liberated approach and not worrying if the final quilt is exactly square or not. Here's a snapshot from the clothesline. I will be adding two more rows to one side of what you see here to bring it up to about 90" square. What fun new things are you working on lately? 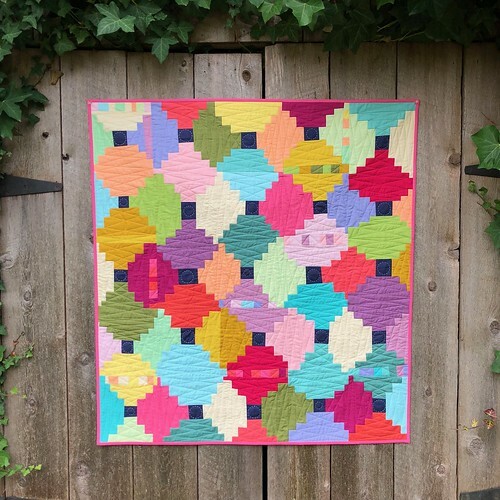 These are such fun fabulous quilts Krista! I hope our guild will snap up one of your spring dates!! I'd been thinking about improv courthouse steps, so seeing your version is serendipitous! I like it alot! Wow, it is!! Stay tuned...there may be a workshop near you fairly soon! Love it! will be watching for the staycation!! Those filler strips are great...I think I will have some leftover's from a class with you! Great colors in the small version!